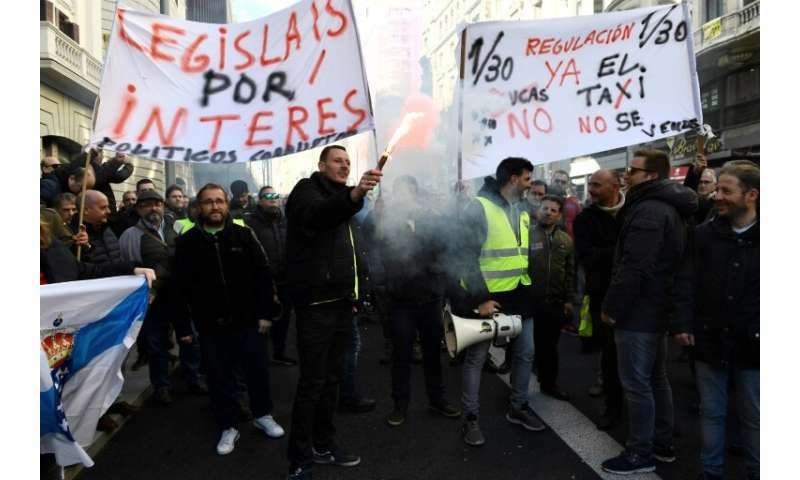 Madrid taxi drivers began an open-ended strike Monday against online ride-hailing services like Uber, joining their counterparts in Barcelona who walked off the job three days ago. Barcelona's striking taxi drivers, many wearing yellow vests like protesters against the government in neighbouring France, blocked central streets and tried to force their way into the Catalan regional parliament but were held back by police. Some police struck the protesters with their batons while three officers were injured by objects thrown at them by demonstrators, said a spokesman for Catalonia's regional police force, the Mossos d'Esquadra. In the Spanish capital hundreds of striking taxi drivers gathered in the central Sol square outside the headquarters of the Madrid regional government as a police helicopter hovered overhead. Some set off firecrackers. The taxi drivers' strike comes just two days before the start in Madrid of the Fitur international tourism fair, one of the world's largest. Spanish taxi drivers complain that rival drivers from ride-hailing apps like Uber and Cabify compete unfairly since they do not have the same regulations and costs. Sandra Serrano, a 32-year-old Madrid taxi driver with eight years experience, said ride-hailing app drivers need to be regulated more tightly because "they drive around the streets and capture our clients and we are a bit sick of it." "We don't mind that they exist but they have to be regulated," she told AFP at the protest in Sol. They are angry about new regulations unveiled Friday by Catalonia's regional government forcing clients to book their services at least 15 minutes before the actual time they are needed. Angel Ion, a 43-year-old Cabify driver, accused taxi drivers of wanting to put them out of business. "Since up until now there was no competition, they earned a lot without much effort. Now that there is competition they have to adapt, lower prices, just like bars, restaurants or any other business does," he told AFP. Drivers for riding-hailing services regularly complain that taxi drivers vandalise their vehicles. Mohamed Bermad, a 55-year-old Algerian, said the windows of his car were broken twice, and his wheels were punctured once, since he joined Cabify 20 months ago. "The problem is that they have remained trapped in time. When I arrived in Spain 35 years ago there was only one television station and one telephone company. Now how many are there?," he added in Barcelona.